The eldest son of North Korean leader Kim Jong-il says he opposes a dynastic succession that would see his younger half-brother take power. Kim Jong-un, the youngest son, has been unveiled as the nation's heir apparent, appearing alongside his father at a series of recent high-profile events. 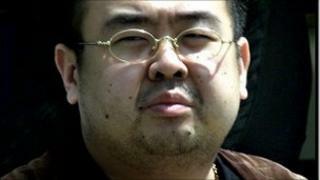 His elder brother, Kim Jong-nam, 39, lives overseas in China and Macau. His comments are highly unusual in the secretive North. But he is not thought to have influence inside the country. He was once thought to be his father's likely successor, but fell out of favour when he was caught trying to sneak into Japan in 2001 using a false passport. "Personally, I am against third-generation dynastic succession," Kim Jong-nam was quoted as saying by Japanese TV station Asahi. "But I think there were internal factors. I think we should adhere to it if there were internal factors involved." He added that, "For my part, I am prepared to help my younger brother whenever necessary while I stay abroad." These comments are not an attempt to challenge the succession. Kim Jong-nam's careful to offer his younger brother his full support, while admitting he feels uncomfortable with the idea of a dynastic transfer of power. In Pyongyang there is a sense that this succession process is well under way now. Last weekend may have been the first chance many North Koreans have had to see the man they call the young general, Kim Jong-un, the current leader's youngest son. But observers there believe the country's leader Kim Jong-il did a deal with the military to try to ensure a smooth transition several months ago. He's clearly not a well man. But the longer he can last, the more chance he has of securing the succession for Kim Jong-un. Kim Jong-nam lives in China and in the gaming resort of Macau, near Hong Kong. Although a member of the ruling family, he is thought to be no longer part of the inner circle that runs the country. In a rare interview last year in China, he said he had "no interest" in taking power. North Korea's ailing leader Kim Jong-il took over the reins of the country after the death of his father Kim Il-sung in 1994. In recent weeks he appears to have designated his youngest son Kim Jong-un his successor. The youngest Kim, who is thought to be about 27, was made a four-star general and promoted to a key position in the ruling Workers' Party last month. He was unveiled to an invited audience of the world's media last weekend during celebrations to mark the 65th anniversary of the ruling party. He would take the Kim dynasty rule over the nation of 24 million into a third generation. He would also inherit a weighty legacy. North Korea is locked in a dispute with the West over its nuclear weapons programme and is struggling to revive its crumbling economy.